Ten songs in Spanish that give a sense of comfort and solace to guide us during difficult times. Similar in style and form to Bendito, Bendito, Entre Tus Manos brings together 10 Spanish songs from cherished Hispanic composers and offers a message of hope and faith to a world where these sentiments can sometimes seem hard to come by. This inspiring contemporary compilation album features new arrangements and recordings of two beloved songs, as well as eight additional tracks that have become favorites of Hispanic prayer groups. Juan Delgado's new arrangement of "Vaso Nuevo" can be used for daily prayer or personal reflection; youth groups especially will be drawn to its message of hope and consolation. 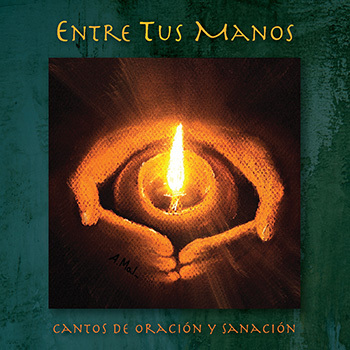 Meanwhile, “Entre Tus Manos” has a new contemporary sound that empowers our trust and faith in God. Both songs have been newly recorded and feature stunning vocals by Azeneth González. Other songs in this collection that can be sung at holy hour or for healing services include “Ven y Restáurame” by Iván Díaz, “Jesús" by Koren Ruiz and “La Oveja Perdida” by Johann Álvarez. Throughout the collection, the passion and experience of all the composers is evident in every note, take, for instance, Estela García-López's moving song about seeking healing,“Cristo, Sáname,” or Jon Carlo García's “Quema Mi Vida,” with its poignant lyrics and beautiful melody. Ideal for Lent, evening prayer, funerals or reconciliation services, “Espero en Ti, Señor” by Santiago Fernández joins the voices of many in a longing for the love of our Lord. All and all, the music in Entre Tus Manos reminds the brokenhearted and the grieving that God is always with us. Let us pray to him with our hearts and trust him with our lives.